Semtech Corporation is a leading supplier of high-quality analog and mixed-signal semiconductor products. Our solutions are used in some of the most innovative systems and products in the fastest growing markets today. These markets include smartphones, LCD TVs, notebooks, tablets, smart grid, automotive, automatic meter reading, medical, wireless infrastructure, PON, Internet of Things, optical transport and datacenters. 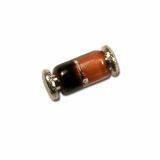 Zener diode 4.7V, 10ma, 500mW, BZV55C4V7, SMD Zener diode model BZV55C4V7, zener voltage 4.7 V, zener current 10 mA, power 500 mW. Diode zener 6.2V, 5mA, 500mW, BZV55C6V2, SMD Zener diode model BZV55C6V2, zener voltage 6.2 V, zener current 5 mA, power 500 mW.